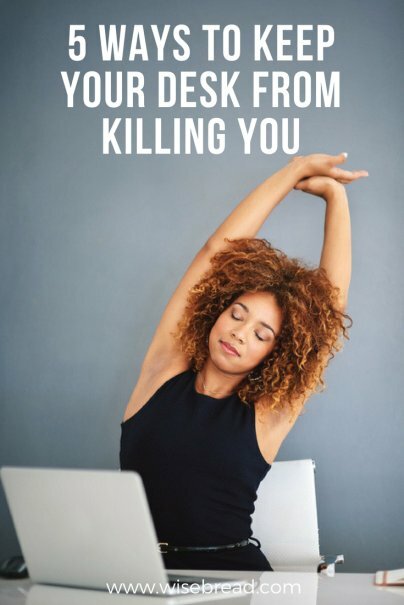 Sitting at a desk all day might literally be killing you. A study in Diabetologia shows that sedentary time in adults can actually lead to increased chance of death, even if you exercise regularly after work. Sitting at a desk all day at work can lead to an increased risk of cardiovascular disease, type 2 diabetes, and cancer. Even worse, sitting still for six or more hours makes you 40% likelier to die within 15 years than someone who sits less than three. Evaluate your surroundings. Is your back hunched? Is your head straight when you look at your monitor? You might need to adjust your chair or move your monitor. Nerd Fitness recommends some great ways to move your monitor and chair around to get the right heights for your neck, back, and shoulders. You can also check out Ergotron's online evaluation. You enter in your height and the system generates exactly how high your chair and monitor should be. You might also need a new chair altogether, so talk to your HR department to see if there is one in storage. Experts recommend five minutes of standing for every 30 minutes of sitting. In fact, most say you should do something every 30 minutes to improve your concentration and your muscles. Instead of sending an email to a coworker, go talk to them. Go for a walk outside while contemplating your next steps. The Focus Booster app can give you reminders every 20 minutes to take a break! There is a small monthly fee, but there is a free (no credit card required!) trial you can do to see if it works for you. I was so excited when I thought of the word "deskercise," only to realize it wasn't original at all. Isometric squats are a good place to start: just place your feet firmly on the floor and push down like you are standing up without actually standing up. Also check out these 33 work exercise moves from Greatist, and these stretch techniques from Fit Body HQ to loosen up. ...But don't stand all day. While standing is better than sitting, standing still is not the answer. Be sure to walk around and stretch your legs every once in awhile. While studies show that standing can increase blood flow, it can also cause joint or muscle pain. In a June study conducted by the International Journal of Environmental Research and Public Health, respondents who worked at a sit/stand desk showed a happier mood and increased energy. For more information, check out Get Up! : Why Your Chair Is Killing You and What You Can Do About It. Although exercising daily doesn't decrease your chances of premature death if you're sitting all day, don't stop exercising! Make sure to walk, run, or do cardio at least 30 minutes every day on top of using the tips above. By doing all of these things, you'll combat most of the negative effects of sitting all day. What do you do at your desk to break up the day?